Rev Fran: "Love and Life for the World." A Sermon from Littlefield Presbyterian Church. "Love and Life for the World." A Sermon from Littlefield Presbyterian Church. "Love and Life for the World"
Would you have believed Elisha? The Bible tells us that Elisha served the twenty barley loaves and the grain, and the hundred people ate, and there was more than enough. There are similar themes in the gospel lesson we just heard. The gospel lesson we just heard is one of the few stories that John and the other gospel writers tell in common. It’s the only miracle story that appears in all four gospels. So, it must have been important to the early church. After this, Jesus went away to the other side of the Sea of Galilee. The verses leading up to today’s gospel lesson set the context. The crowds are following because they saw Jesus perform SIGNS. Jesus has healed the official’s son and a man by the pool. The amazing things Jesus has been doing create a sense of anticipation for what is to come. A large crowd was following him, because they saw the signs that he was doing on the sick. Jesus went up on the mountain and sat down with his disciples. Jesus looked around at the large crowd and asked Philip, “Where are we to buy bread, so that these people can eat? John tells us that Jesus said this to test Philip, as he already knew what he would do. Then Andrew said, “There’s a boy here who has five barley loaves and two fish--but what are they for so many?” Andrew sees the possibilities, but he’s still concerned that they don’t have enough. Jesus said, “Have the people sit down.” John mentions that there was a lot of grass in the area, which made it a comfortable place to sit down and have a picnic. There are four gospel stories that tell about Jesus feeding 5,000, and Matthew’s and Mark each add a similar story about Jesus feeding 4,000. In all six stories, there are lots of left-overs! At the center of the story is a miracle. Now, if I were to tell you that it happened exactly the way the story says it did, some of you might get a little cranky. Some folk have a hard time believing that sort of thing… or would tell us that nothing like that has ever happened to you. The way some people get more comfortable with this story is to explain that of course many of the five thousand people had a little food tucked away in their tunics—something they planned to sneak off and eat by themselves—but that Jesus got them to share what they had, so that there was plenty for everyone, with twelve baskets left over. According to that kind of thinking, the MIRACLE is that Jesus got them to share. I think that interpretation has some merit, and it’s helpful to some folk who struggle with how to interpret the miracle stories in the Bible. But that’s not what the Bible says. and that when the people saw it, they knew who he was. They understood the feeding of the five thousand as God’s divine hand in human affairs—God’s supernatural interruption of the natural order. There was bread where there hadn’t been any bread…fish where there hadn’t been any fish. That proved who Jesus was to them…and established their faith in him. The miracle made people believe. It gave them faith where there had been no faith—the same as it gave them food where there had been no food. 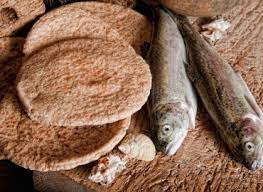 I’m not going to try to tell you how it happened that Jesus was able to feed thousands of people that day in the Galilee, because I can’t explain it in a pat, rational way that would satisfy everyone. But I believe the gospel writers when they say that something amazing and extraordinary happened, and that many hungry people got fed-- when it looked like there wouldn’t be enough. In the midst of what looked like scarcity, there was abundance! I think it was C.S. Lewis who said that a miracle is something that takes your freedom away along with your doubts… something that leaves you no choice but to believe. You witness a miracle—or, as John the Evangelist would say, a "sign"-- and it makes you have faith. But I’m not so sure about that. Without faith, there are always other explanations for even the best of miracles. You say you heard the voice of God? It sounded like ordinary thunder to me. She was healed of her illness? It was probably psychosomatic in the first place. Come to think of it, though, is there proof for anything that really matters in the world? Are there homegrown, ordinary miracles you can think of—that there’s no evidence for… nothing that could prove them to anyone else…or to you—if you didn’t believe in them first. Could it be that we’ve gotten it all backwards somehow? Maybe faith doesn’t come after miracles—but before them? Perhaps what makes something holy--what makes it a glowing and life-giving wonder—isn’t something about it…but about us. In today’s gospel lesson we hear echoes of the Passover-Exodus story. Chapter five ended with complaints about a shallow, superficial understanding of Moses. But chapter six intends to show a deeper, fuller understanding of Moses and the Passover, which is now revealed in Jesus. When Jesus miraculously feeds the multitude in the wilderness, the people remember the promise that God will raise up a prophet like Moses, and they confess that Jesus is that prophet. What they fail to realize what this sign actually reveals. Instead of seeing in Jesus the embodiment of God’s glory, love, and Word, they see a king…a political or military figure they hope will serve their desires. The crowds are missing the point of what’s happening. They see Jesus’ gracious gift--but they want him to manifest a glory that fits into their assumption and serves their goals. How often do we fail to see the depths of what God is doing, because we’re focused on what serves our desires? How often do we fail to realize how graciously God is acting among us, for our sake and for the sake of the whole world? We only see partially and in distorted ways. We need the continuing word of Jesus and the gift of his presence, if we are to move more deeply into God’s glory. When the story moves to the next scene, we hear more echoes of Passover. Jesus, knowing that the people in the crowd wanted to make him king by force, had withdrawn again to a mountain by himself. Then, when evening came, his disciples went down to the lake, where they got into a boat and set off across the lake. A strong wind was blowing, and the waters grew rough. When they had rowed about three or four miles, they saw Jesus approaching the boat, walking on the water…and they were frightened. But Jesus said to them, “It is I. Don’t be afraid.” Or, more accurately, we could read Jesus’ response as “I am.” “I am” and “Don’t be afraid” are the language of theophany. I think Brian Peterson is right when he suggests that, in John’s language, it’s a “sign,” a window into the glory of God present in this world through Jesus. Like the crowds in John 6, we have been fed by God’s grace and mercy and care and steadfast love. Like them, we often fail to see what God is doing among us. We look for a Messiah or king who will serve our desires or our agendas. He calls us to feed the hungry--to provide food and clean water to those who lack the basic things of life. But we look around and we’re afraid that our resources aren’t sufficient to meet all the needs. We’re afraid there won’t be enough. Perhaps part of the miracle of our life of faith is that we creatures are able to make use of our freedom: to believe in spite of our doubts…to have faith without proof…and that because of those capacities in us, miraculous things do happen from time to time. Some of them are extraordinary. But most of them as ordinary as the voices of our fellow human beings telling us that we are loved…that we are precious in their sight and God’s…that they want to link their lives with ours…that together we can, with God’s help, change the world. Together, we can practice trusting in God’s abundance and grace. Together, we can receive from Jesus’ hand what he gives and go out into the world with the gifts. As Gentile readers of the twenty-first century, do we get it? This message is for us, no less than to the ancient church in Ephesus. God has a plan for us, for us to be strengthened in our inner being with power through God’s Spirit…for Christ to dwell in our hearts through faith…for us to be rooted and grounded in love…for us to be filled with the fullness of God. We come together to be fed…filled…to open our lives to God in prayer…and to be transformed by God’s power. Do we believe in that kind of miracle-- the kind of miracle in which we believe enough in God’s grace and power to risk giving our lives in prayer? When we’re weary from responsibilities with family, work, and church, the vision of God leads us back to the way of love and LIFE. What kind of a miracle might we experience if we pray for a bigger vision of God? What kind of a miracle might we be a part of-- if we pray that we will see our life in the center of God’s goodness…that Christ might dwell in our hearts? What kind of a miracle might it be if God overwhelms us with grace and it overflows in our lives and makes a difference in the world? So… let us pray for faith in God’s power working in our world and in our leaders. Let us pray for God’s power in us to do everything that we can do to stop terrible hatred and violence in our world. Let there truly be peace on earth, and let it begin with you and me. Now, to the One who by the power at work within us is able to accomplish abundantly far more than all we can ask or imagine, to God be glory in the church and in Christ Jesus to all generations, forever and ever. Exodus 3:14; Isaiah 43:10, 25; 4`:12; Genesis 15:1; Exodus 14a;13. Lectionary Homiletics, July 30, 2006, p. 80.